Mary Gottschalk has proven her versatility as a writer by crafting a highly acclaimed memoir, Sailing Down the Moonbeam, followed by a novel, A Fitting Place. Both volumes are gutsy stories, and in this guest post Mary explains how writing the memoir prepared her for the challenge of switching to fiction. Writerly skills are for naught unless you have something you want to write about. The story behind my memoir—a mid-life coming-of-age experience after I left a successful career to sail around the world at age 40—had steeped in my brain for two decades before I put pen to paper. Not once, in all those years, did the possibility of writing a novel ever occur to me. But as the memoir evolved and my writing skills improved, I began to see that “the story” was much bigger than “my story.” Sailing across the Pacific Ocean struck me a metaphor for life: you can’t control your environment, the route is not well marked, and you often end up someplace other than where you set out to go. The core lesson of that voyage was that you learn the most when you step outside your comfort zone. Suddenly I had a story with almost infinite variations. I itched to explore them. Voilà, my first novel about a woman who never leaves home, but is thrust out of her comfort zone when she is betrayed by those she trusts most. It is my first novel, but it will not be my last. I often think of my memoir as the literary equivalent of training wheels. 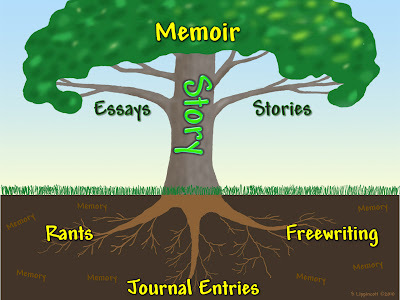 With a memoir, the task is far more manageable than with a novel, where every element—story arc, characters, plot points, scenes, point of view—is in flux until “THE END.” With an infinite number of possible events and characters from which to choose, even an experienced writer can have trouble discerning whether a problem lies in the writing, in the story arc and structure, in the pace, in the mix of characters, or some combination of them all. For an inexperienced writer, sorting it out can seem all but impossible. By contrast, the outer boundaries of my memoir were established long before the first word hit the page. I knew where the story began and ended, who the players were and what role they played. The plot points and scenes were constrained by reality. My job, as author was to connect the dots, not make them up. Connecting the dots was certainly not enough to guarantee a good memoir. If you believe, as I do, that a well-written memoir should read like fiction, I needed to have much the same set of writerly skills as a novelist. As a neophyte, I was missing many of them when I started out. In retrospect, one of the great advantages of starting out with a memoir was that when things weren’t going right, there were fewer things to be fixed. As a memoirist, I couldn’t change the trajectory of events, so I had to focus on doing a better job of building tension and establishing cause and effect within the existing storyline. I learned, by trial and error, to recognize which events moved the story forward. I discovered how it felt when my story began to unfold organically. I learned that ruthlessly cutting out events that serve no plot purpose could heighten the emotional truth of the story, with little damage to factual accuracy. Similarly, I couldn’t create new scenes or new characters out of whole cloth. All I could do was focus on re-writing those that were flat, on learning how to make them come alive, on using them more effectively to carry the plot forward. My focus was on mastering the art of showing vs. telling, on finding the right balance between dialogue and narrative. I learned that what I didn’t say often had as much dramatic potential as what I did say. Throughout the often painful process of repairing crippled parts of the story, it was easier to push forward, knowing that I had a clear idea of what I wanted the story to look like when it was complete. By the time I began my novel, I had developed solid skills in constructing a story arc, both for the book as a whole and for each chapter along the way. I knew how to use dialogue and develop my characters through judicious use of scenes. I still had a lot to learn, but completing the memoir gave me the confidence to attack one problem at a time, to avoid being overwhelmed by the enormity of the task. The memoir served as my training wheels. Without it, there never could have been a novel. Mary has made a career out of changing careers. After finishing graduate school, she spent nearly thirty years in the financial markets, first in New York, then in New Zealand and Australia, eventually returning to the U.S. Along the way, she dropped out several times. In the mid-80's, at age 40, Mary and her husband Tom embarked on the three-year sailing voyage that is the subject of her memoir, Sailing Down the Moonbeam. When the voyage ended, she returned to her career in finance, but dropped out again to provide financial and strategic planning services to the nonprofit community. In her latest incarnation, she is a full time writer. Her first novel, A Fitting Place, was released May 1, 2014. Find A Fitting Place on Amazon and iBooks. Mary, I love this, "my job as an author(of memoir) is to connect the dots, not make them up." You have described the differences between writing memoir and fiction very clearly. Personally, I can't imagine anything being more difficult than memoir writing but I suppose once that hurdle is achieved, one has been duly prepared to take on fiction. In finding your universal theme in memoir, you then explored it in more depth through fiction. Wonderful post with lots of writerly pearls. Thanks to both you and Sharon. The story behind the story is as intriguing and enlightening as your memoir and novel! Well put, Kathy. Thanks for thoughts. Thanks Kathy. Until I was nearly finished with the memoir, I agreed with you ... I couldn't imagine anything more difficult. But as the pieces fell into place, I wanted to continue to explore the theme ... and I didn't have a "part 2" waiting in the wings, as you do, so a novel seemed to be my only option.